Chile stretches across 4,290km and boasts a diverse landscape including the moonscapes of the Atacama Desert, the beautiful Valparaiso Port Town, Chiloe Islands, the Lakes district and the rugged mountains of Patagonia. This sample itinerary includes these regions showing off Chile’s variety. If you would like to create your own tailor made itinerary please contact us to discuss what options you are most interested in. 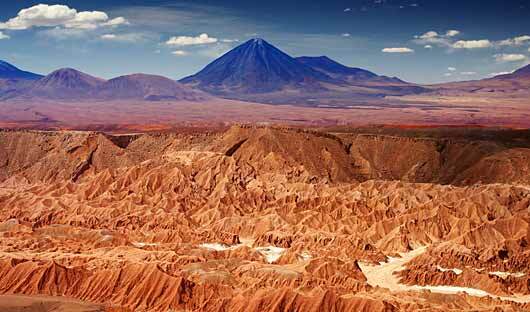 You may also like to include some stops in Argentina, Peru or Bolivia which we can certainly do. 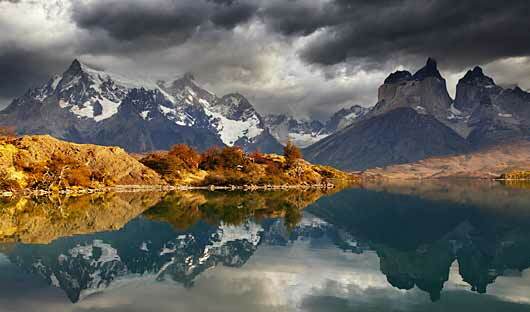 Contact us to start creating your own tailor made itinerary in South America. Arrive in San Pedro de Atacama. Set in the heart of the Atacama Desert, this small oasis town is well situated for daily adventures into the surrounding desert region and to the Salar de Atacama. Choose from a variety of guided half and full-day explorations and activities to explore Atacama – cultural and archaeological tours, easy walks and more challenging treks, mountain-biking, visits to salt flats and thermal geysers, wildlife and bird-watching. 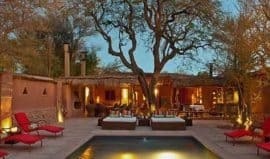 Awasi Atacama, situated in the historic desert town of San Pedro de Atacama, is an intimate luxury retreat that truly lives up to its name, a Quechua word meaning home. Constructed in a circular layout and designed using native materials, the resort comprises eight enchanting cottages. Each cottage is assigned a 4WD vehicle and a private guide who will arrange customised excursions for guests, selected from an extensive menu of wonderful experiences. The cuisine is as impressive as the hotel. The professional chef has designed a sophisticated menu that is a fusion of Altiplano and international food, providing you with a taste of new flavours and aromas obtained from typical ingredients of the area. The Atacama is the most desolate and arid desert in the world and the Andean Altiplano will surprise you with its dramatic, exotic, awe-inspiring beauty. 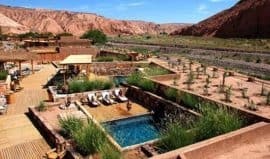 The Alto Atacama is built in the style of a traditional adobe settlement, complete with llamas and native crops, Alto lies in a spectacular setting at the base of the Cordillera de la Sal (Salt Mountains), only 3km from San Pedro de Atacama town. The hotel occupies 3½ hectares of beautiful desert and its gardens are filled with native plants and locally crafted artworks. The spacious rooms display a ‘modern-minimalist’ style and each has a private terrace. Delicious cuisine is served in the main restaurant or one of two outdoor patios, and the six outdoor pools and a top-class spa make this a perfect base for your explorations. 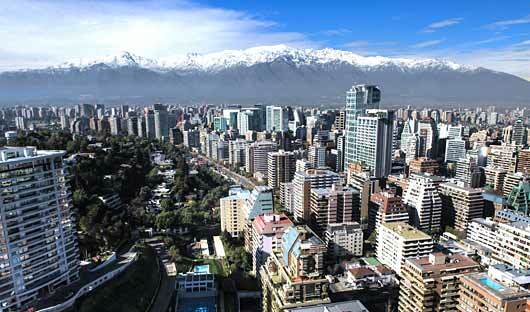 Fly back to Santiago, and the following day enjoy a guided tour visiting the city’s main landmarks. Drive to San Cristobal Hill for great views of the city and the Andes mountains. Contrast the old and new parts of the city as you continue to the residential areas of Vitacura Las Condes and Providencia. 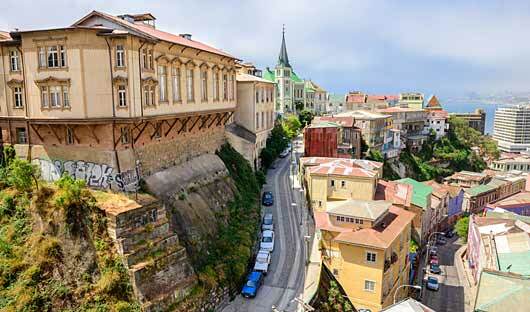 The following morning depart from your hotel for a full day tour including Valparaiso. Travel to Curacaví which is renowned for its fruit production and especially its own regional ‘chicha’ made from the fermented juice; here you will stop at a ‘chicheria’ to taste this special alcoholic fruit drink. Continue heading west to the Casablanca Valley, well known for some of the best white wines in the country, and visit the organic Emiliana Vineyard where you will be shown around and learn about the wine production before enjoying a tasting of the finished product. Drive on through the Casablanca Valley to arrive on the Pacific coast at Valparaíso, Chile’s oldest and most important seaport, bustling with activity. With its improvised urban design and unique architecture clinging to the hillsides, Valparaiso is a labyrinth of winding narrow streets, cobblestone alleyways and colourful hillside neighbourhoods. Continue a short distance north around the bay to Viña del Mar, the most famous and visited seaside city of the area. Its many parks with huge trees and palms have led it to being known as the “Garden City”. Also visit the beaches and the 1930s-era Casino, and learn about its history. In the late afternoon, again pass through the agricultural valleys of Curacaví and Casablanca, en route back to Santiago. The Singular Santiago, newly emerged in the city’s historic Lastarria neighbourhood, has been designed to embrace the area’s cultural and artistic heritage while adding a cutting-edge modernity. It maintains an old-world feeling with 19th century French influences, while incorporating a contemporary elegance and high level amenities. Accommodation ranges from small Patio rooms and Asian-styled Classic rooms to the top Singular room category with larger bathrooms and small balconies. All are traditional in styling, with a timeless décor that mixes limited edition prints, hand-crafted furniture and polished parquet floors. The hotel’s restaurant combines European and Chilean cuisines, with a French twist on local dishes, while the lobby bar has the feel of a private members club with its brass lamps, leather armchairs and marble bar. Meanwhile, The Singular’s rooftop bar and terrace, with a plunge pool, offers superb views over the city. 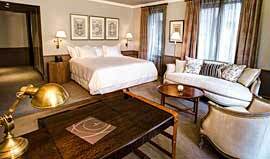 The Lastarria Boutique Hotel is nestled into one of central Santiago’s bohemian enclaves. The vibrant and culturally intense Lastarria neighbourhood abounds with small restaurants, bistros and galleries. This renovated 1927 historic mansion is an eclectic mix of traditional architecture and modern design. Behind the Art Deco façade, just 14 rooms are spread over 4 floors and, left in their original configuration, each differs in size and shape and all have dark-wood floors, antique carved furniture, and tiled bathrooms. From the 1st floor breakfast room and terrace, stairs lead down to a luxuriant garden where high walls enclose a small outdoor pool. 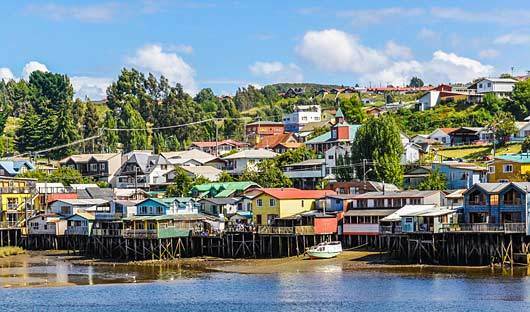 Fly to the quaint fishing island of Chiloe, home to 150 intricately-shingled wooden churches. Enjoy a day of included activities around the Island of Chiloe. 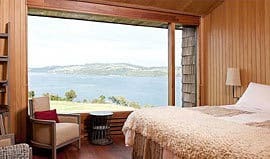 Located in a hilltop setting at the edge of the sea, Tierra Chiloe is the perfect retreat, an all-inclusive lodge that has been inspired by Chiloé’s iconic palafito stilt houses – elevated on a glass-and-concrete base, with exterior larch-wood shingles and inside walls lined with native cypress paying tribute to the local mastery of woodcraft. The contemporary hotel comprises 12 rooms, a cosy living room with fireplace, dining room, bar and a terrace, as well as a spa. From every room and all communal areas and terraces, there are magnificent views of the sea, as well as some of the islands and the imposing Andes Mountains. Transfer via ferry and private vehicle to Puerto Varas in the Chilean Lakes District. 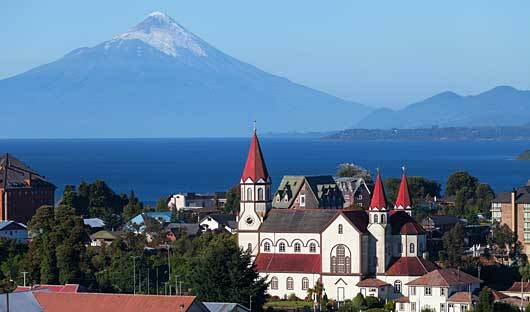 Tour around the spectacular Lake Llanquihue and Osorno Volcano. 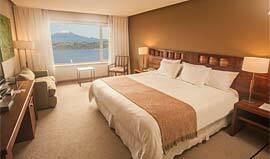 The Cumbres Puerto Varas is built in the contemporary-chalet style located on a hill on the edge of the city. 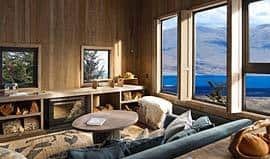 The hotel commands amazing views across Lake Llanquihue to Osorno Volcano and anabundant use of wood and glass has given it a real connection to the environment. While the design is sleek and modern, the hotel still retains a cosy feel and there are lots of welcoming corners in which to spend time. Comfortable sofas grouped around the open fireplace open out to the main restaurant and outdoor dining area. 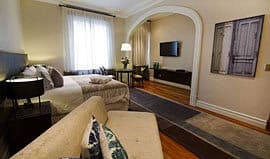 Each of the guestrooms is especially spacious and has something unique – a balcony, a bow window, a small living room. Fly into Punta Arenas where you will spend the night. 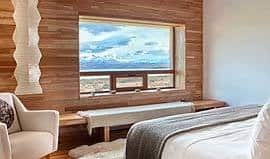 The following day transfer by private vehicle into the spectacular Torres del Paine National Park and stay at a lodge with impressive views of the majestic rock mountains. Enjoy your choice of half or full-day excursions that, depending on the property, may include a range of treks, mountain-biking, guided adventures by vehicle, horse-riding, bird-watching, cultural tours, and visits to nearby estancias to see and experience the seasonal activities. The Tierra Patagonia is situated on a bluff where the pampas meets Lake Sarmiento, on the north-eastern edge of Torres del Paine National Park. This stunning hotel is almost invisible until you arrive, the contemporary design blending so perfectly with the rugged surroundings in its use of the natural materials of the region. Casually luxurious with lovely public spaces and guestrooms boasting handcrafted furniture and uniquely Patagonian details – and everywhere those incredible big-sky views. Gourmet chefs wine and dine you, and after your excursions into the wilderness, take advantage of the Uma Spa with an indoor swimming pool, an outdoor Jacuzzi, sauna and steam bath. Awasi Patagonia is spread out like a classic estancia, with just 12 deluxe villas dotted throughout native forest in a private nature reserve just outside the national park. It has a rustic vibe but with all modern comforts, and each villa is carefully positioned to ensure the utmost privacy while also offering the best views. The villas are very spacious, with a king bed, large bathroom, a cosy wood-burning stove and capacious sofas in front of a panoramic window – and a private hot tub under the stars! The main building, with the restaurant and comfortable lounge, is no more than a 5-minute stroll or short golf-buggy ride from the furthest villa. Journey back to Punta Arenas and fly on to Santiago for a final night. Depart Santiago the following day. This itinerary can easily be added to a Peru itinerary. 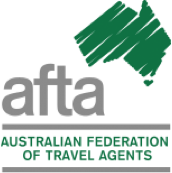 Please contact our expert travel consultants to create your own personalised itinerary. Call 1300 784 794 or email contact@satc.com.au.